Since 1936, the name Roll-A-Way has been synonymous with quality in the materials handling industry. 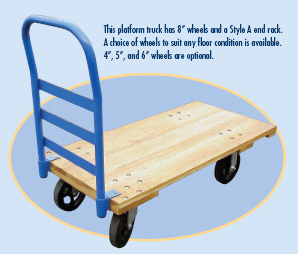 The outstanding features of our popular hardwood deck trucks reflect the reasons why. The wood platform is a solid 1-1/4” hardwood deck, sanded and double varnished for appearance, longer wear, and durability. Reinforced cross members lend additional support. 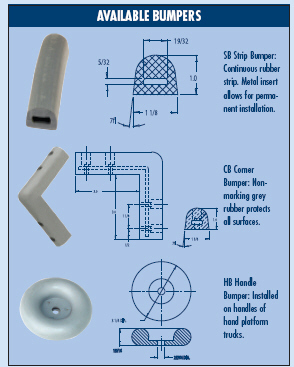 The end racks are removable, constructed of thick wall pipe, and easily inserted into heavy pipe sockets. The casters (2 swivel and 2 rigid) are bolted to the cross members, are standard with 2 hardened ball bearing swivel raceways, lubrication fittings, and a selection of wheels. 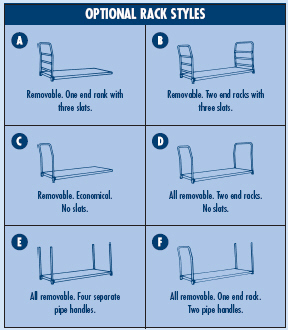 See price list for optional features such as bumpers, racks, wheels, and angle frames.